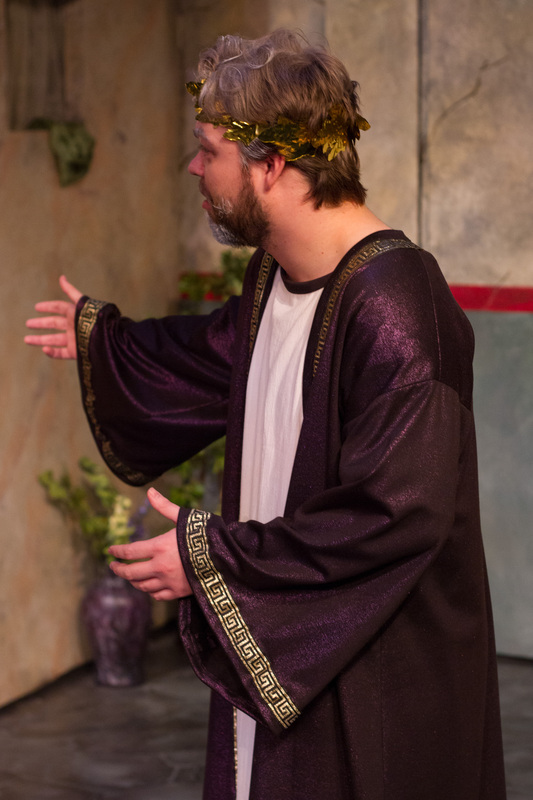 This winter I have been helping with the Walterdale Theatre production of the Stephen Sondheim musical comedy A Funny Thing Happened on the Way to the Forum. I’d never been involved with a large production or a Walterdale show before, and it’s been an amazingly educational and enriching experience for me. I watched the directors and actors figure out the character arcs and stakes. I watched the ensemble learn the choreography and marvelled at how well it fit the characters. I learned to tape out a floor, to be “on book” for people learning lines, and to work out what props had to be where when. There are so many aspects that have to fit together – so many skillsets that are all needed – so many creators and crafters and collaborators, all taking their jobs seriously but having a lot of fun making a very funny show. Director and choreographer Adam Mazerolle-Kuss (current artistic director of the Walterdale) and the actors on the stage (eighteen of them!) have generated a set of appealing interesting characters who go through a funny story full of complicated twists and turns, with lots of opportunities for silliness, choreography, and memorable Sondheim songs. I can’t pick a favourite character or favourite moment, because there are so many parts that make me laugh or smile every time (I don’t have favourite brothers or favourite students, either. Even if some of them are reading here.) Music director Brian Christensen and seven other talented musicians provide accompaniment. During the rehearsal period, one of my favourite things about being ASM was getting to the theatre early and turning on some lights to see what delightful details had been added by the set builders and painters, designers and props master since the last time I was there. And then the lighting effects began to be added in, and I don’t even know how that works but it became even more magical. There is an apocryphal quotation about laws and sausages being products one should avoid seeing the production of. I can tell you now that based on my experience on the crew of A Funny Thing Happened on the Way to the Forum, theatre is not like that at all. The more I watched this show being built and helped to contribute to it, the more impressed I was with what we were creating, and the more I fell in love with theatre. So I have two recommendations for you. First, buy a ticket to Forum and come watch. And second, if you like watching theatre, think about getting more involved. Lots of theatre companies need volunteers for taking tickets and selling Twizzlers. Community theatres like the Walterdale offer opportunities for involvement with productions. Every theatre I know of needs money and needs word-of-mouth advertising of shows. Take improv class! Take acting class! Take singing lessons! Take dance lessons! Try stand-up comedy! Try storytelling! Write a script and get it workshopped! Edmonton has opportunities for adult novices to do all of the above. A Funny Thing Happened on the Way to the Forum opens Wednesday April 2nd and runs until Saturday April 12th, after a free preview for students with student ID on Tuesday April 1st (that’s today!). Evening shows are at 8 pm, and the Sunday matinee is at 2 pm. You can get to the Walterdale Theatre easily on the #4 bus or park nearby (the pay lot for Strathcona Market always has space, but you might luck out with a nearer parking meter. You can get tickets at Tix on the Square or at the door. Photo credits to Douglas Stewart. 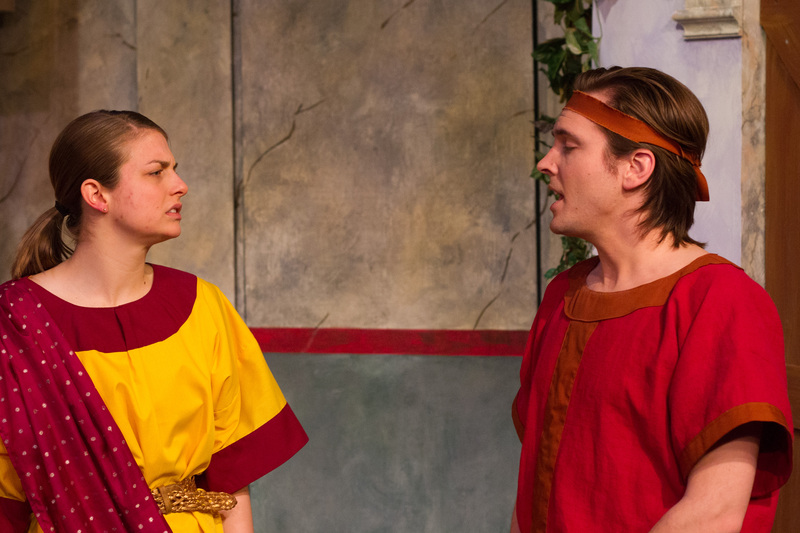 On the left, Kelsey Visscher as Hysterium and Kyle Thulien as Pseudolus, on the right Jordan Ward as Senex. This entry was posted in Theatre and tagged adam mazerolle-kuss, brian christensen, david johnston, funny thing happened on the way to the forum, walterdale on April 1, 2014 by Ephemeral Pleasures.